Step into the 1920's world of the Great Gatsby with Quiet Events! 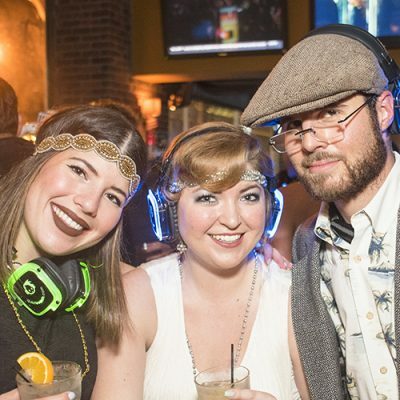 We'll be making everything a sign of the times, so costumes are of course fully encouraged, being that the only thing that won't be 1920's style, will be those glowing headphones on top of our heads. This is going to be a great night, with 3 DJ's to help us rock the night away, so if you're going to be out, this is definitely the place to be! DJ 1 (Green): Top 40 hits, Dance, Pop with a mix of 1920's Party Music Remixes and Electro Swing! DJ 2 (Red): 80's, 90’s, and 2K Throwbacks! Haven’t been to one of our events? Check out these videos to see what we’re about.